Mark of Medusa Video Slot Guide & Review - Casino Answers! Mark of Medusa is a 5-reel, 25-line Microgaming video slot. 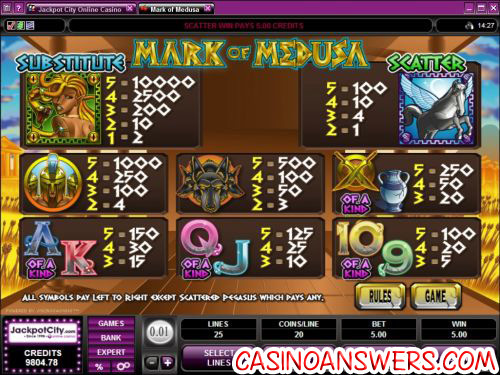 Mark of Medusa features wild substitute symbols, scatter wins and a free spins feature. You can play Mark of Medusa at Jackpot City Casino and Nostalgia Casino. Mark of Medusa’s coin values consist of $0.01, $0.02, $0.05, $0.10, $0.20 and $0.25. To start playing the video slot, select one of these coin values, your number of active paylines (up to 25) and the number of coins you wish to bet per line (up to 20; 10 is default). The Mark of Medusa minimum bet is $0.01, while the maximum bet is $125. Mark of Medusa is designed for both casual players and high rollers. Of course, if you consider yourself somewhere in between, you will be happy with Mark of Medusa’s betting options as well. If you prefer to view your bet in credits rather than coins, hit the F9 key for the game options and you can switch it over. You can also turn on the QuickSpin setting while you’re at it. Once you have your desired bet ready, you can hit the “Spin” button. If you want to play all 25 lines at 20 coins per line, hit the “Bet Max” button. Mark of Medusa’s top jackpot is 10,000X your bet per line when five Medusa symbols appear on an active payline. 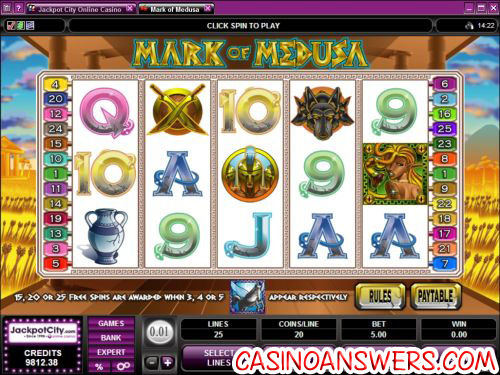 Medusa is also the Mark of Medusa slot’s wild symbol and will substitute for all symbols except the scatter symbol. When the Medusa symbol completes a winning combination, the symbol will become animated. Her eyes will glow green and the snakes will move about and “hiss” at you. The Pegasus (horse with wings) symbol is the scatter symbol in Mark of Medusa. Unlike all other symbols that pay left to right, the Scattered Pegasus symbol will pay no matter where it is on the reels. They don’t even need to be on active paylines. You only need two of them to pay out. Whereas payline wins are multiplied by the total coins staked per payline, scatter wins are multiplied by the total coins staked. Scatter wins will be added to payline wins. If 3, 4 or 5 Pegasus symbols appear on a spin, you will win 15, 20 or 25 free spins with a 3X multiplier. The 3X multiplier means all of your winnings will be tripled during the free spins feature. The free spins feature can be re-triggered. The free spins will be played at the paylines and bet of the triggering spin. Free spin wins will be added to your payline and scatter wins. Changing Mark of Medusa into Expert mode will enable you to use the slot machine’s autoplay mode. In the autoplay mode, you can set the number of spins (5, 10, 25, 50, 100, 250 or 500) and to stop if a win exceeds a selected amount ($100, $500, $1000, $5000 or $9999). Additionally, there are 5X and 10X buttons for quick access, if you don’t wish to use any of the advanced features. The autoplay mode will stop if you trigger the free spins feature. You can cancel autoplay at any time. The Mark of Medusa video slot is a couple of years old now, but it holds up really well. It could perhaps use a bonus game, but other than that, we like its presentation including the look, graphics, sound effects and music. The free spins feature is a very nice inclusion due to the ability to win up to 25 free spins with a 3X multiplier. We also can’t forget about that 10,000X top jackpot, which is larger than you will find on most other video slots. To get a $500 signup bonus to try Mark of Medusa, sign up at Jackpot City Casino! Can I find Mark of Medusa at any US-friendly casinos? Unfortunately, no Microgaming casinos are US-friendly at this time. US players can find a Greek-themed slot called Caesar’s Empire at the US-friendly Slots Oasis Casino. At Slots Oasis, you can get a stunning 400% up to $4000 signup bonus! What is a good microgaming slot?